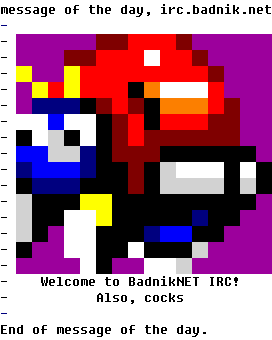 BadnikNET is an IRC server affiliated with Sonic Retro and is the official home of the Sonic Retro IRC channel. Its operators are the Sonic Retro Administrators. The server was created in August 2007 to accommodate the move of The Sonic 2 Beta Page to Sonic Retro's webserver and hosted #retro and #s2beta until #s2beta changed its name to #retro. The name "Badnik" is from the alternate name proposed during the restructuring of Sonic Classic in spring 2006. The server's unofficial mascot is the Sonic the Hedgehog badnik Moto Bug. This page was last edited on 15 April 2018, at 13:11.